FIFA 17 is a football video game in the FIFA series. It would be released on 27 September 2016 in North America and globally. FIFA 17 will be the first FIFA game in the series to use the Frostbite game engine. 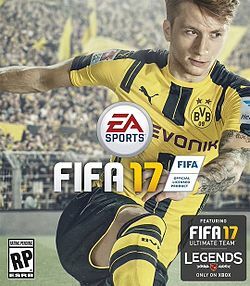 On 21 July 2016, it was announced that Marco Reus would feature on the cover of FIFA 17. The new features in FIFA 17 include new attacking techniques, physical player overhaul, active intelligence system and set piece to rewrite. Powered by Frostbite technology: One of the industry’s leading game engines, Frostbite delivers authentic, true-to-life action; takes players to new football worlds, and introduces fans to characters full of depth and emotion in FIFA 17. A fresh new story mode: In FIFA 17 for the first time ever in FIFA, live your story on and off the pitch as the Premier League’s next rising star, Alex Hunter. Play alongside some of the best players on the planet, work with four authentic managers and take part in a brand new football experience, all while navigating the emotional highs and lows of The Journey. Physical play overhaul and new attacking techniques: FIFA 17 represents the transformation in the way players physically interact in all areas of the pitch. Control is now in your hands as you battle for space and possession. Plus, new options in attack give players more ways to create shot chances and finish in front of goal. Set piece rewrite:In FIFA 17 from free kicks to penalties to corner kicks, inject personality into your game and experience control from every dead ball situation. Active Intelligence System.In FIFA 17 a brand new system introduces constant spatial analysis, increases activity off the ball and changes the way players move, read, and react. Here are the recommended and minimum specifications required to run FIFA 17 your computer. Like most of the EA games, FIFA 17 is also available in 3 editions i.e. standard edition, deluxe edition, and the super deluxe edition. FIFA 17 has not been launched so I have not played FIFA 17 yet and can't give my feedback on the same. You can pre-order FIFA 17 from the official EA website. Thanks for reading stay tuned for more reviews and guides on the latest games. Hope you enjoy FIFA 17. Why don't you give a review this time? Tell me about the game below in the comments section and get a chance to win FIFA 17 super deluxe edition for free.